Writing this article came about by way of a strange coincidence. The morning of the Oregon v. Washington game, I received a text message from a coaching friend in Oklahoma. His question was simple: “You think GT Counter Read works from Pistol?” Neither of us had seen anyone do it before, so we weren’t sure of how the timing and exchange would work. Lo and Behold, the Ducks would run this exact play, multiple times, later that night against the Huskies. 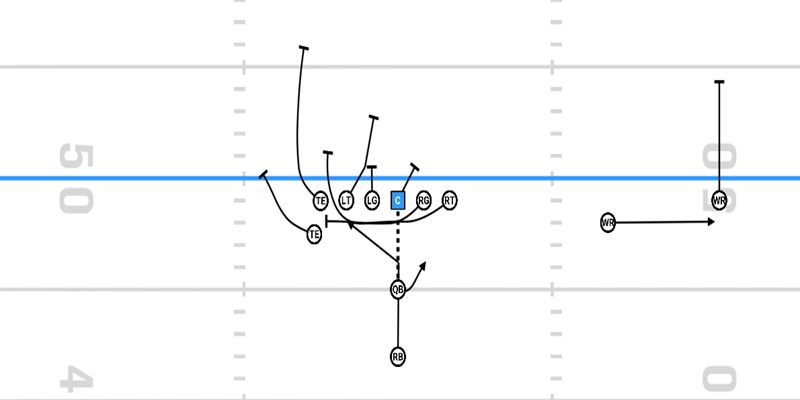 The GT Counter Read (diagram above) is a gap run scheme most notably used today by Oklahoma Sooners head coach Lincoln Riley. 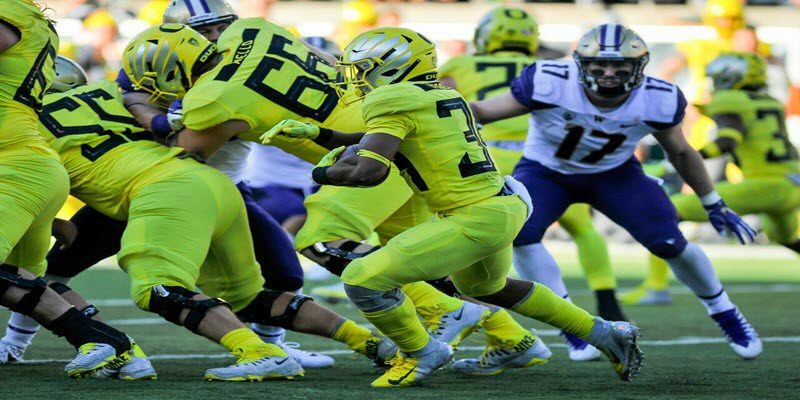 While Riley prefers to implement the play from his more Shotgun based offense, Oregon has run it from both the Shotgun and Pistol this season. Though the look that we will be studying today is out of 12 personnel (1 RB, 2 TE), the GT Counter Read can be run from any personnel set, including 10 personnel (1 RB, 0 TE). From this same 12 personnel look, Oregon also ran this play flipped, with the two TEs arcing to the pull side and becoming lead blockers for the QB. Being able to flip the play within the same look eliminates tendencies the defense can key on. The GT in the name of the play simply means guard/tackle. These are the two positions that create the blocks at the point of attack (clip above). As you can see, the play side tackle through center are going to follow down blocking rules, with the tackle being able to create a double team with the guard before moving on to the second level. The backside guard is going to pull and trap the play side DE, while the backside tackle pulls through the now vacated area to lead block for the RB. Here, the read side DE widens, prompting the quarterback to give the ball. If the DE crashes (yellow circle above), the QB will pull the ball and run it out the backside. Should the QB run into trouble, he also has the ability to throw the Bubble Screen, making the play a Triple Option. If the numbers are right pre-snap, the QB can hit the bubble right away, making the play a pre snap RPO (“run pass option”). In the game footage above, pay attention first to the movement of the RB. Like most Pistol runs that hit between the tackles, the RB is going to lean a bit at the snap before taking his first step. This insures that the ball has made it to the QB and sets the timing of the mesh. You’ll see that CJ Verdell takes his first step with the leg opposite of the side he’ll be taking the ball. This creates a sort of lateral step effect, pulling him to the right just enough to create the space for the mesh. Because of the downhill nature of the RB at the exchange, he is able to stay tight and seamlessly get behind his pulling tackle to the opposite side. This actually happens much easier than I had thought when first asked about the possibility of this play. Above is an example of what I meant by being able to flip the direction of this play within the same personnel look. Here you will see the TEs arcing and becoming lead blockers for the QB, should he pull and keep the ball. I’m glad the strange turn of events that led me to this article happened the way they did. Not only do I really like the design of this play, but it gave me something really cool to share with all of you.